Yesterday night I wasn’t in the mood to be too productive, after all, the week end was just starting. I was randomly browsing the Internet, looking for food for thoughts. I came across Steven Noel‘s personal blog and notice at the bottom of the page some links, including one to its first usenet post in 1994. I immediately asked myself, when was my first post on the Internet ? Or, at least, what is the oldest trace of me that Google can find ? Same day : I explained how to send FTP commands to an internet server, using a proxy BITnet email server. Are these my first posts on BITNet’s LISTSERV system ? I can’t remind. These are the oldest one Google can find. Today, because this post is not business related, because it is the week end, because my friends and family in the US just celebrated Thanksgiving, I would like to finish this post “a la” Doc Teger, i.e. with a song. This is the end. Let a new adventure begin ! I am looking forward new challenges, new adventures, new innovations …. Java CAPS, Sun’s SOA platform has been certified by Swift for 2009. We passed the very strict Swift test suite and received the much convoyed "Financial EAI 2009" Swift label. Java CAPS has received this certification for eleven (11) years in a row ! 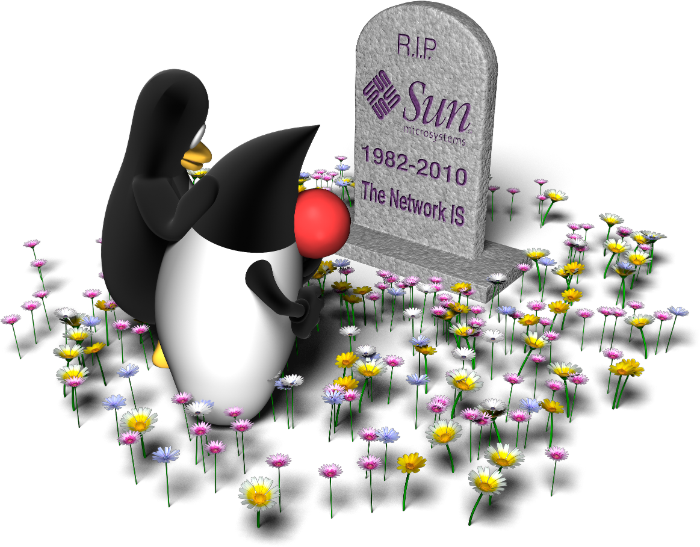 As every year, JavaONE attendees have access to a public set of SunRay thin clients for Internet access. This year however, the user experience is different. Attendees do receive access to a full, dedicated virtual machine with their OS of choice : OpenSolaris, Ubuntu or Windows Vista. When the attendee inserts its conference card into the SunRay, he is prompted to choose a desktop, the desktop is booted in a virtual machine on one of our servers and delivered to the thin client in a couple of seconds. When the attendee removes the smart card from the SunRay, the virtual machine is suspended and stored for later usage, the day after or later. Each time the attendee reconnects the smart card in any of the 200 available SunRays thin clients, it receives back its very own personal virtual machine. Wonder about the infrastructure we deployed to provide this service ? Check out this article which goes pretty much into all the details. Lab 5557 : Building JavaFX clients for RESTful and JSON based web services. Rich Internet Applications – RIA – do require a strong service access and data access layer located on the back-end, just as traditional or web based applications. It is therefore essential to combine desktop technologies and server technologies in order to provide fast, efficient and secure access to your data. This lab will teach students how to combine desktop technologies, such as JavaFX™ technologies, and back-end technologies, like web services and REST based services to build state of the art desktop applications. This lab will go through a very simple example of REST data retrieval and a Java FX graphical representation of these data. Patience is a vertue …. and it pays ! Since several years, Solaris x86 (and now OpenSolaris) users are complaining about the lack of a decent PDF viewer for our platform. Surprisingly Adobe maintained up-to-date it’s SPARC version, but not the x86 version. This is probably a sign of the OpenSolaris adoption rate : Adobe just released Acrobat Reader 9 for Solaris and OpenSolaris on x86 platforms. Brian has the installation procedure. Registration is now open for Community ONE conference in europe ! Join us for a jam-packed day of education, innovation, and exchange. Come together with fellow developers and technologists to evaluate dozens of open-source projects currently powering leading Web companies, transforming enterprise IT, and enabling next-generation computing. I will present a JavaFX application and demonstrate how to communicate between JavaFX and REST based web services. Seeing you in Olso !